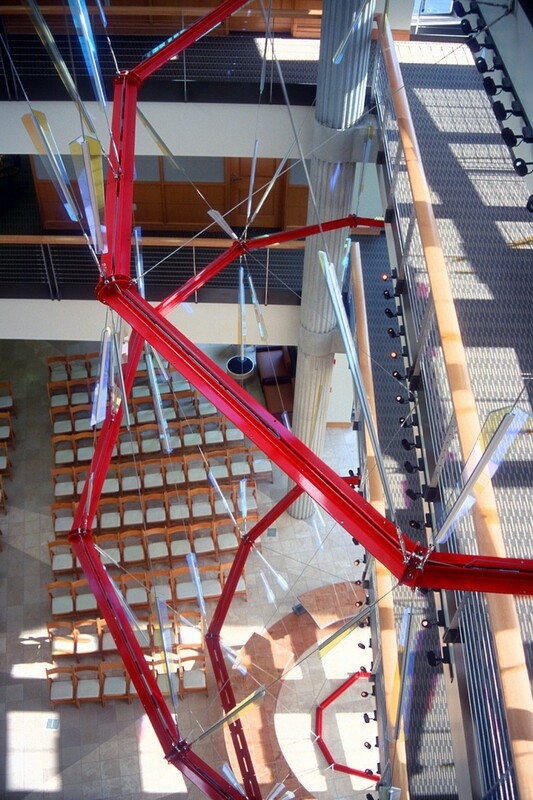 “Ring Thing” is a 72′ high aluminum, stainless steel, and glass sculpture and floor and bench design in the new Leichtag Family Foundation Biomedical Research Building on the campus of the University of California at San Diego. 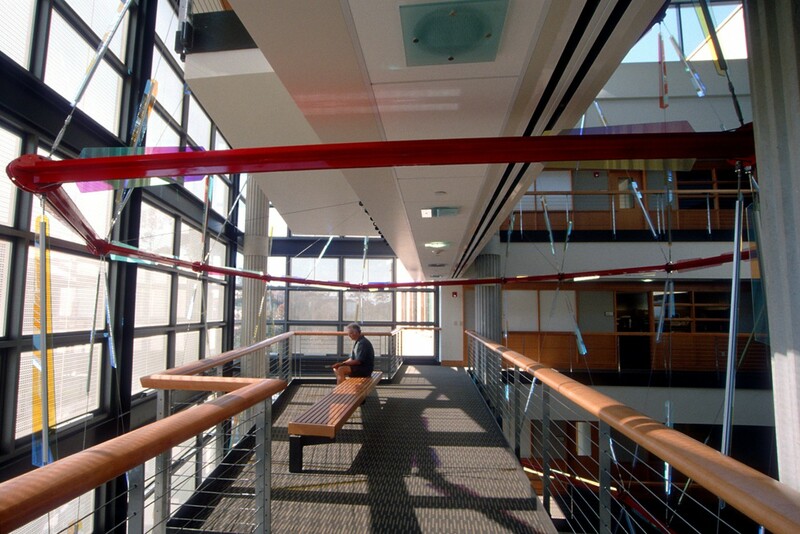 The facility, designed by Zimmer, Gunsul, Frasca Architects, was completed in April of 2004. 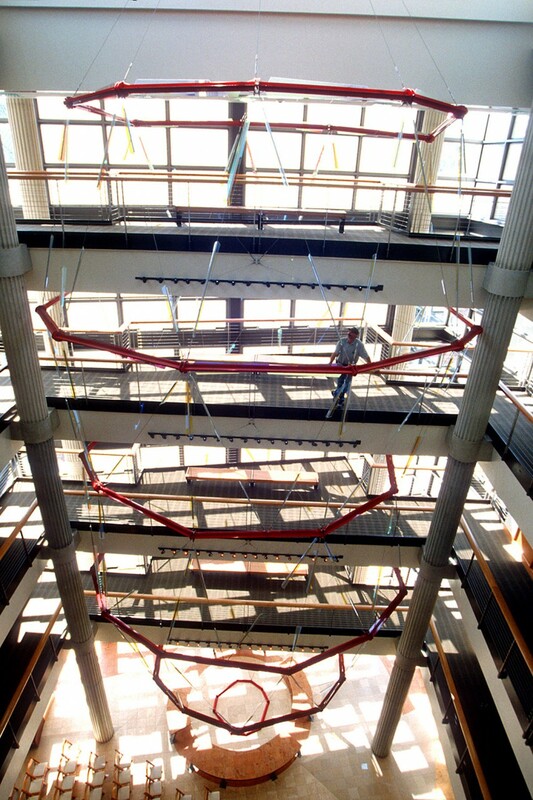 During the almost four-year process of design and fabrication of the sculpture, Carpenter collaborated closely with ZGF architects, representatives of the University, and with the general contractor, McCarthy Builders. Through this collaboration, he designed the towering tension structure, surrounding benches, and stone floor to which it is tethered. 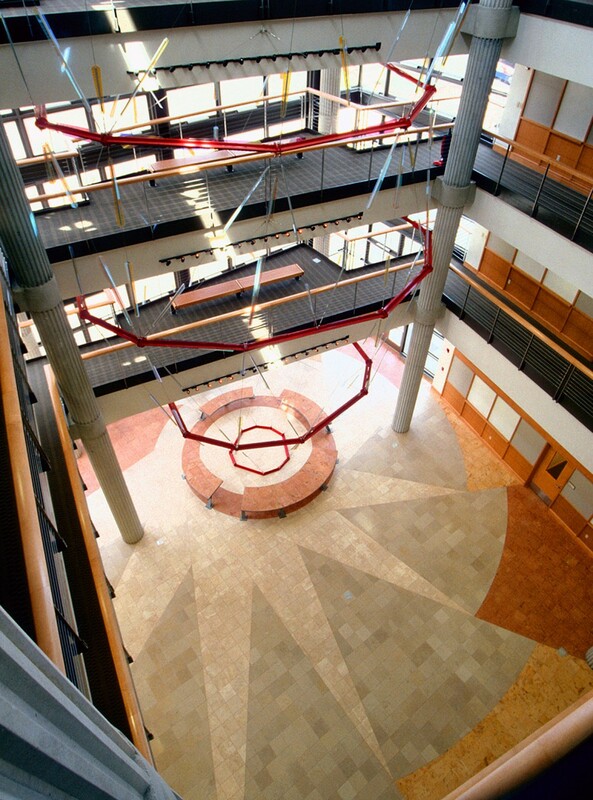 These elements are the dominant features of the Scholarly Interaction Space (SIS), an atrium on the sunny west side of the building meant to attract interaction and discussion among the researchers working throughout the building. 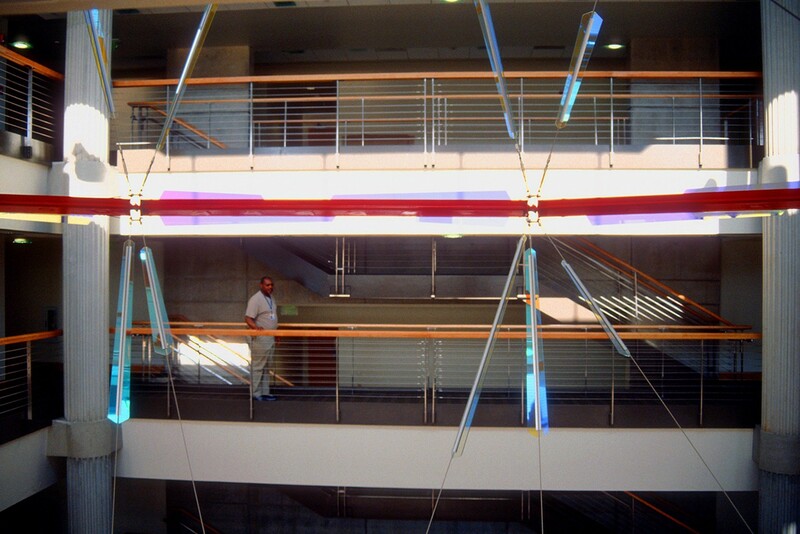 Their offices and labs adjoin the SIS, which is provided with benches on four levels of balconies where they can actually sit within the airy sculpture and experience the play of light off its red aluminum frames, stainless steel cables, and suspended dichroic glass elements. Carpenter’s concept developed as he sketched on tracing paper over architectural section drawings of the SIS. After an initial impulse to work within the central volume surrounded on four sides by balconies, he eventually discovered that by shifting the sculpture’s focus toward the west, and allowing the sculpture to envelop the bench-lined balconies, he could create a much more dynamic relationship with the building and its users. 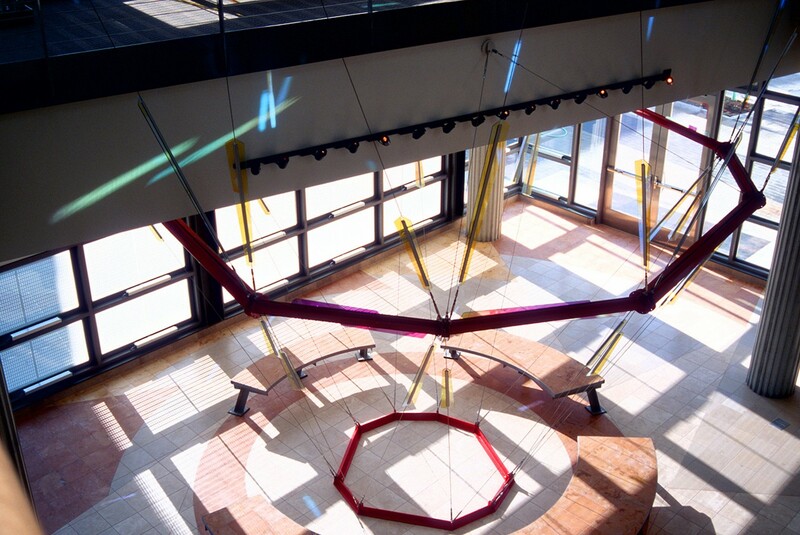 This concept envisioned many stainless steel cables anchored at the highest ceiling, descending through five gigantic faceted aluminum rings, and anchored to the floor at the apex of a radiating design in stone. 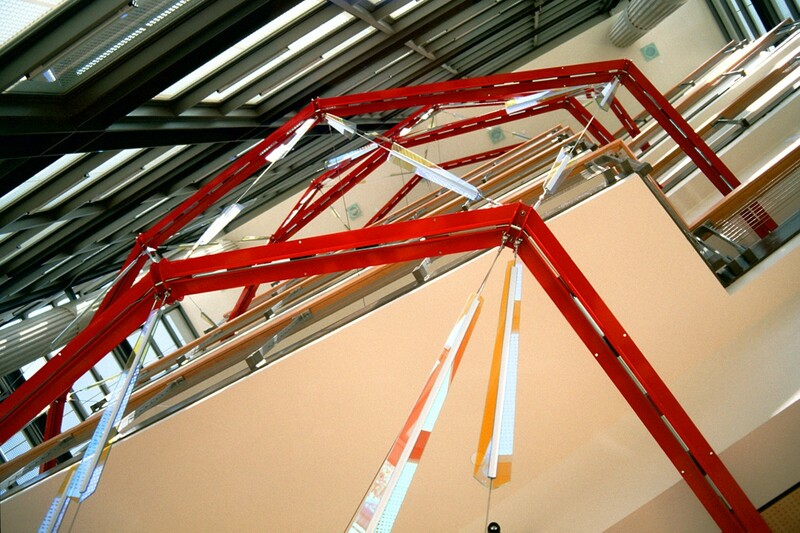 While physically enormous in relation to the SIS, the resulting sculpture began to be reminiscent of forms that the building’s researchers might see in their microscopes. So the tension between the huge and the microscopic brought additional energy to the concept. 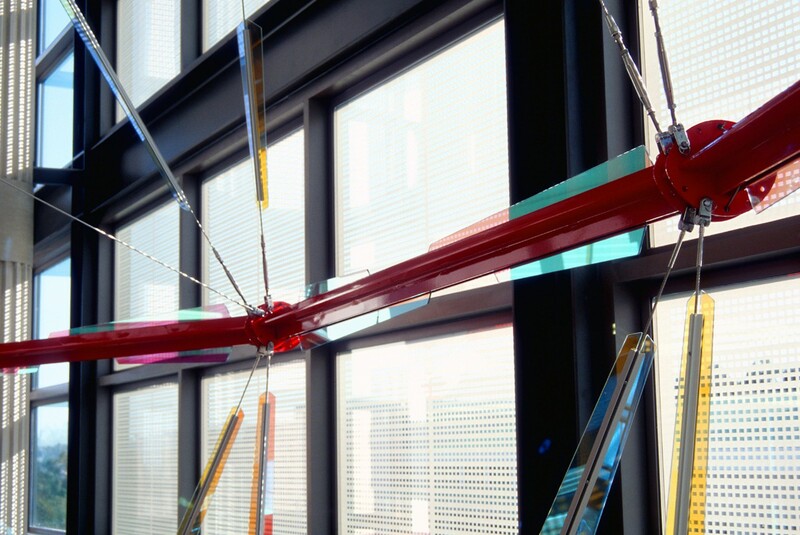 Materials: Aluminum, dichroic glass, and stainless steel cables.